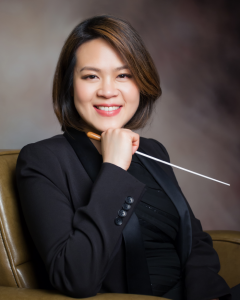 Julia Tai has established herself as one of the most dynamic young conductors on the international stage. She is currently the Music Director of Philharmonia Northwest, and the founder and co-artistic director of the Seattle Modern Orchestra. Her career has led to acclaimed performances and rehearsals with orchestras around the world, including the American Youth Symphony, Bakersfield Symphony Orchestra, Bohuslav Martinu Philharmonic (Czech Republic), Brandenburger Symphoniker (Germany), Estonian National Youth Symphony (Estonia), New Symphony Orchestra (Bulgaria), Orquesta Sinfónica Juvenil Carlos Chávez (Mexico), and the Seattle Symphony. She has participated in the renowned Cabrillo Festival of Contemporary Music, the Summer Institute for Contemporary Performance Practice at the New England Conservatory, and worked with legendary composers, performers and ensembles such as Jonathan Harvey, Tristan Murail, Graeme Jennings, Garth Knox and Ensemble Modern. Born in Taipei, Taiwan, Ms. Tai began her violin studies at age four and piano at eight. She received her Bachelor of Music and Master of Music degrees from the University of Southern California Thornton School of Music, where she was honored with the departmental award of “Outstanding Graduate of 2004.” She obtained her Doctor of Musical Arts degree from the University of Washington, where she served as the principal conductor of the Contemporary Ensemble, and the assistant conductor of the University Symphony and Opera. She studied conducting under the tutelage of Peter Erös and Jorge Mester, and has participated in conducting masterclasses with Marin Alsop, JoAnn Falletta, Neeme Järvi, Daniel Lewis, Gustav Meier, Otto-Werner Müller, Jorma Panula, and Larry Rachleff.